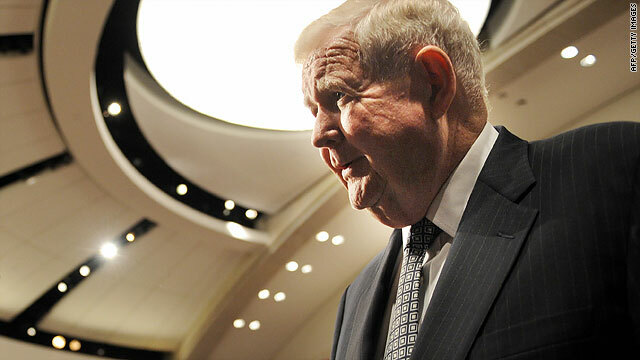 Rep. John Murtha died Monday after complications from a gallbladder operation. (CNN) -- Taking out a patient's gallbladder is routine. At least 500,000 such surgeries are done each year in the United States. It takes an hour or two, and the patient can go home that day or the next. But in rare cases, the surgery can be deadly. Democratic Rep. John Murtha of Pennsylvania recently died after complications from the procedure after doctors "hit his intestines" during surgery, a source close to the late congressman told CNN. Murtha underwent the scheduled laparoscopic surgery at the National Naval Medical Center in Bethesda, Maryland, on January 28, to remove his gallbladder, and was discharged. Three days later, he was admitted to Virginia Hospital Center's Intensive Care Unit because of major complications from surgery, the hospital said in a statement. He died there Monday at age 77. The National Naval Medical Center declined to reveal additional details on Murtha's death. At most, only one out of every 1,000 patients dies during gallbladder removal, according to the American College of Surgeons. Factors that increase the risk of death include gangrene, a burst gallbladder or severe diseases. The laparoscopic surgery is a safe, minimally invasive procedure, said Dr. L.D. Britt, president-elect of the American College of Surgeons and professor at Eastern Virginia Medical School. Out of hundreds of thousands of cases, only a handful result in damage to the intestines, he said. Precise statistics are not available. "Even when you have an injury, it doesn't often, obviously, lead to death," Britt said. "This is very surprising, but we know that death is a possible complication of any procedure." Video: Surgery error link to Murtha? The gallbladder, a small pear-shaped organ under the liver, squeezes bile from the liver out into the small intestine. Signs that this organ may need to be removed include sharp pain in the right abdomen, low fever, and nausea and bloating. In a laparoscopic cholecystectomy, the technical term for the procedure, the surgeon removes the gallbladder with instruments placed into four small slits in the abdomen, according to the American College of Surgeons. This kind of surgery is performed to remove gallstones or to remove an infected or inflamed gallbladder. A laparoscope, a telescope-like instrument with a light and video camera on the end, helps the surgeon see inside the abdomen. Removal of the gallbladder this way usually takes one to two hours. This is much more common and less invasive than an open cholecystectomy, which involves making a six-inch incision in the abdomen and cutting through to the gallbladder. Injury to the intestines during the procedure is rare, but it is a risk that patients are informed about before surgery, said Dr. Albert Wu, professor of health policy and management at the Johns Hopkins Bloomberg School of Public Health. If the intestine is perforated, stool can leak into the abdomen, causing an infection that leads to a severe illness called sepsis, he said. If the patient begins taking antibiotics immediately when that happens, that could solve the problem, but if the perforation goes unnoticed and several days pass, the infection can get worse and result in death, Wu said. This is just one possible scenario, however, experts said. It is unknown at what point during the procedure his intestine may have been harmed, or in what way. "It certainly is a surgical error, I just don't know where the mistake [was], how that occurred," Britt said. The damage could have occurred during dissection or, alternatively, when inserting the trocar, a surgical device that aids the introduction of other instruments into the abdomen, Britt said. Another possibility is that the heat probe could have injured the intestine, and later the area that got burned could have opened up and leaked, Britt said. The takeaway message is to always call your doctor or come back in the hospital if you feel unwell after surgery, experts say. "If you suspect that something is wrong, without delay you should contact the surgeon because time really is of the essence," Wu said. A 2009 study led by the Mayo Clinic found that almost 9 percent of U.S. surgeons who responded to the survey said they had made a major error in the previous three months. "No operation is 100 percent free of complications and problems," Britt said. "The best you can do is, obviously, follow instructions, as I'm sure [Murtha] did." Britt stressed that the laparoscopic procedure is common. He performed three last week, two that went smoothly and one of which needed to be converted into an open procedure because of scar tissue. The public should not be frightened, he said. "At the end of the day, if you don't have it done and you have a diseased gallbladder, you're talking about a very high complication rate and a possibility of death," he said.